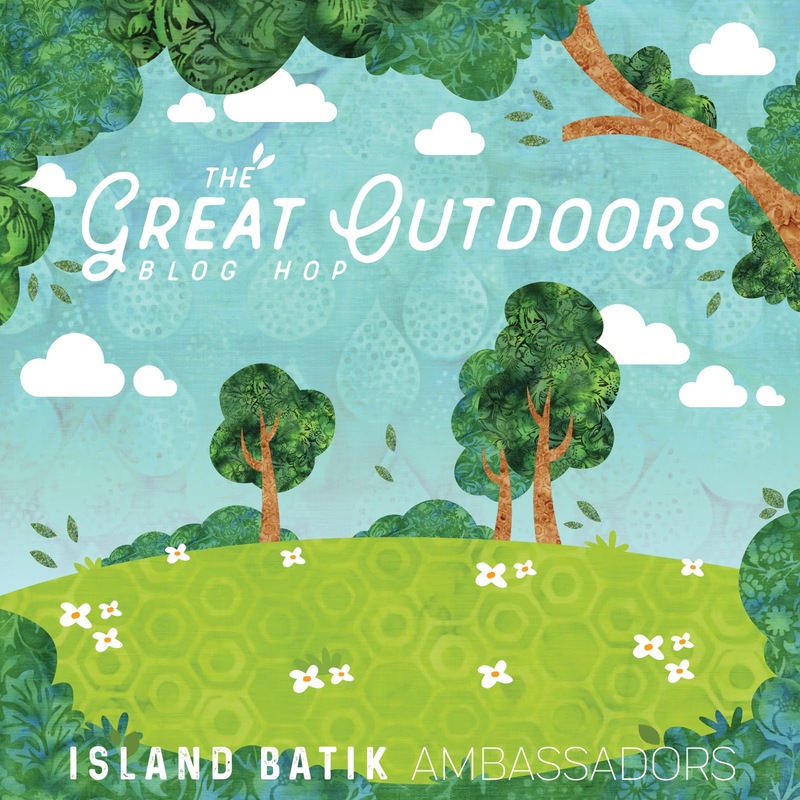 Welcome to the my stop on The Great Outdoors Blog Hop, a five-week showing of quilts made by Island Batik Ambassadors using the newest collections. These fabrics will be shipping to stores very soon. 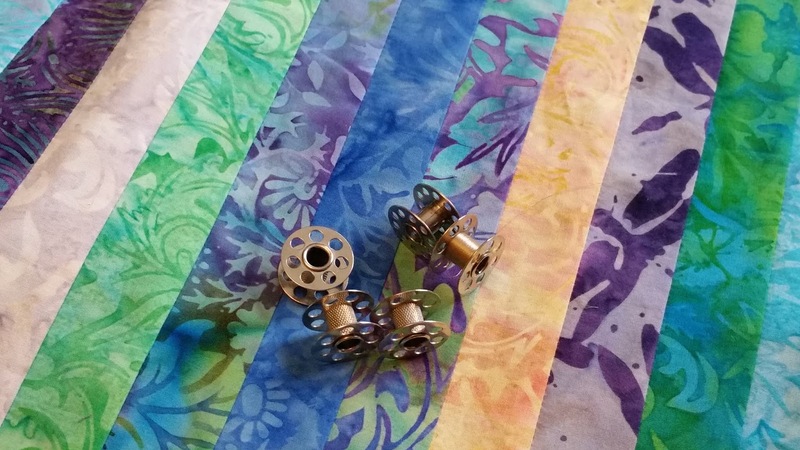 Back in February when the first box of goodies arrived from Island Batik, each contained a bundle of not-yet-released fabrics that were (literally!) 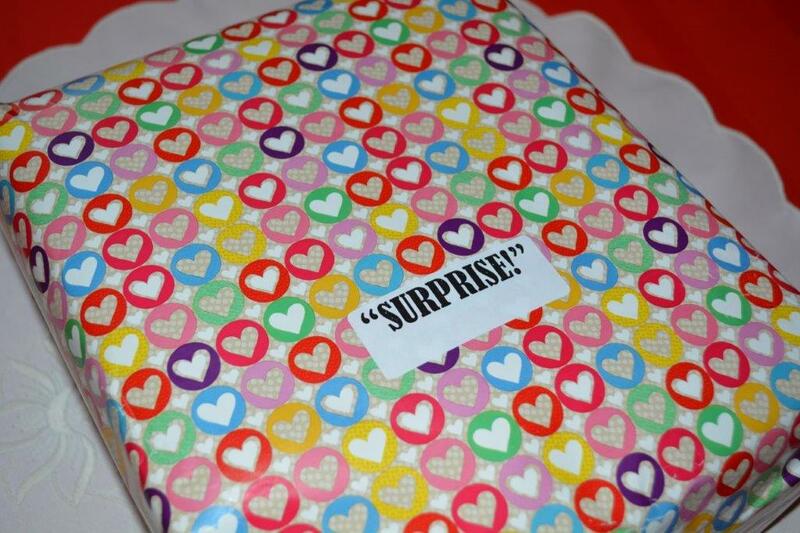 under wraps. 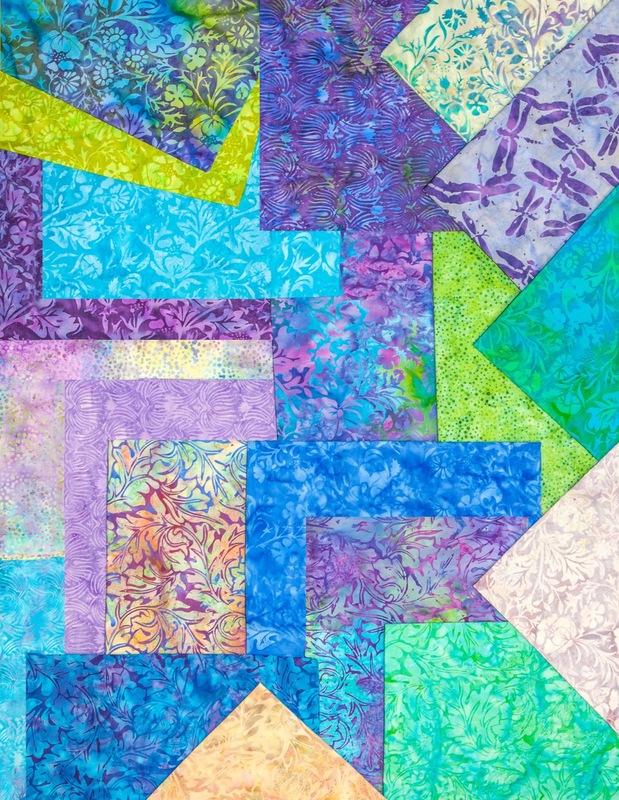 Not everyone received the same collection, of course, as Island Batik has many beautiful lines, so you will be seeing a fabulous variety of quilts and colours. 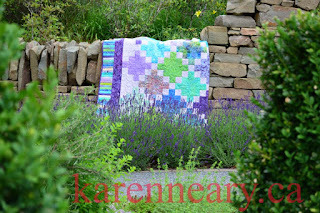 I was thrilled when I opened my surprise packet to find a gorgeous collection called "Eclectic Garden." Lush purples, greens, and yellows, with dragonflies, and blooms in rich, saturated colours. If only I could grow such a garden. You can see the entire collection at Island Batik. We received very generous half-metre cuts of all 22 fabrics in the collection, as well as 2 yard cuts of light and dark for borders. 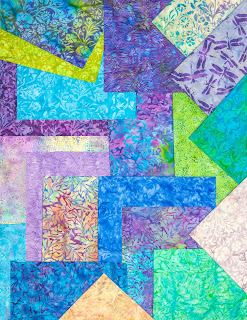 Much thought went into deciding what design to use for the quilt; I knew I wanted to use as much of the fabric as possible, in fairly large chunks to show off the prints. 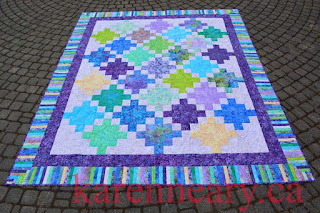 I decided on a reverse Irish Chain, where the colours are used in the centres and the white forms the connecting chains. This is a rough sketch I drew in EQ8 to give me a visual to work from. 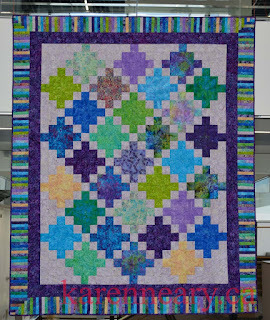 As I wasn't planning to pattern this, I didn't spend a lot of time arranging my colours on screen, or adding borders to the sketch, so it doesn't much resemble my finished quilt. It just kept me on track for layout. 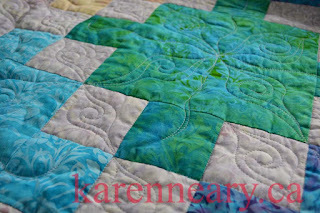 To keep the math easy, I cut 9" blocks. I had JUST enough creamy white for the background; what you see cut off below is literally what was left over. Whew - talk about cutting it close! 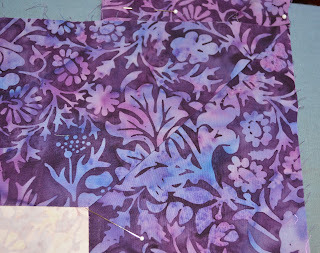 I added a 3" mitred inner border with the deepest purple yardage. 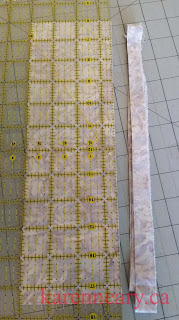 Then I gathered up all that was left of my pieces and sewed 1" strips together for a piano key border. 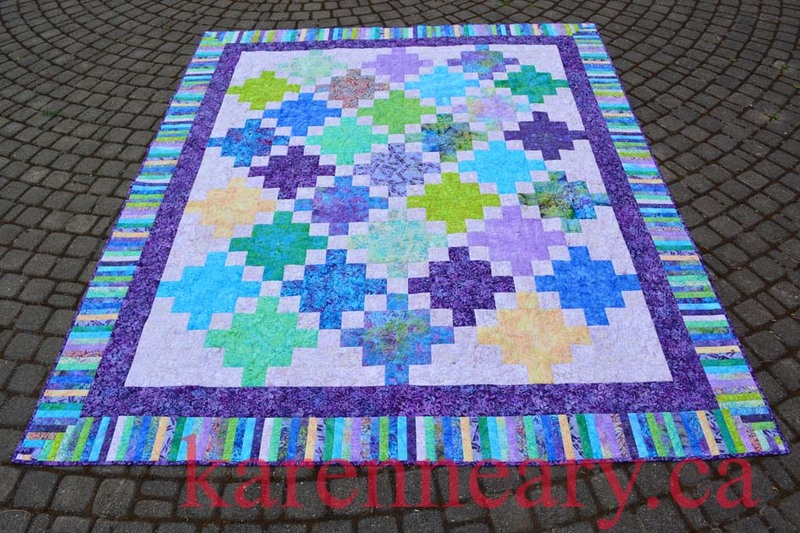 This is a very colourful quilt. Hobbs Batting is one of the Ambassador program sponsors, and I was pleased to use this fluffy Poly-Down batting. 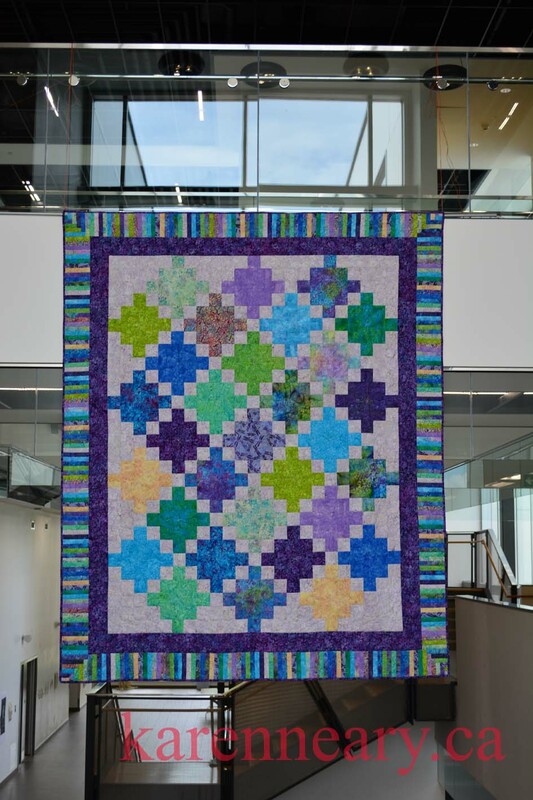 It quilts beautifully. 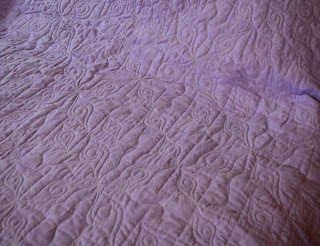 For the first time in years, I decided to send this quilt out to be long-arm quilted. 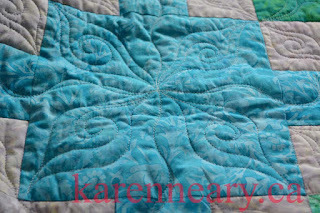 I contacted the very talented Denise White of West Branch Quilt Studio and was delighted that she agreed to fit me in. 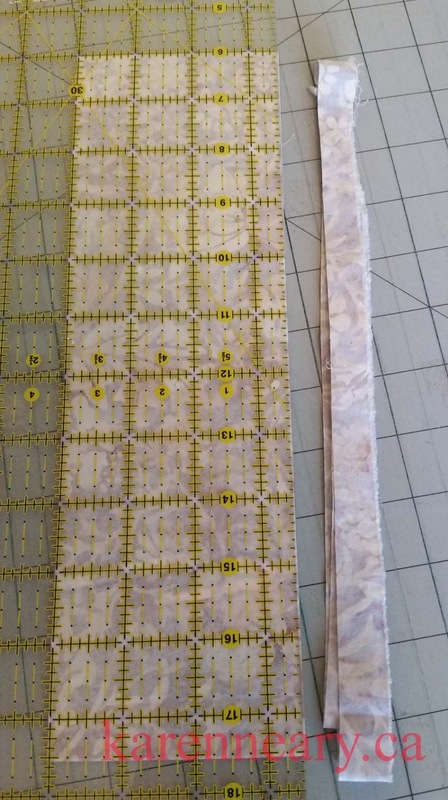 She was happy to come up with a custom quilting plan that suited this piece to a T. Aurifil had sent along some 40 weight thread and we chose a neutral Dove Grey, #2600, which Denise used both top and bottom. 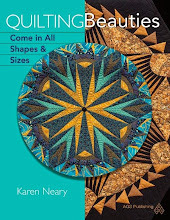 She used about a spool-and-a-half of these 1000m cops in her beautiful quilting. Denise's work is so pretty; you can contact her via email here. 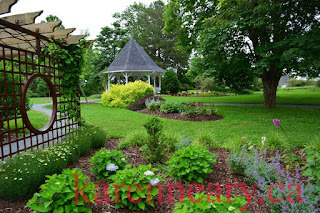 One of my favourite gardens in which to photograph quilts is Alumni Gardens on the Agricultural Campus of Dalhousie University, in Truro, Nova Scotia. (Hubby's alma mater.) Recently they've added this barley ring at the entrance to the grounds, which is reminiscent of the school ring. We took a couple of pictures in various spots in the gardens. 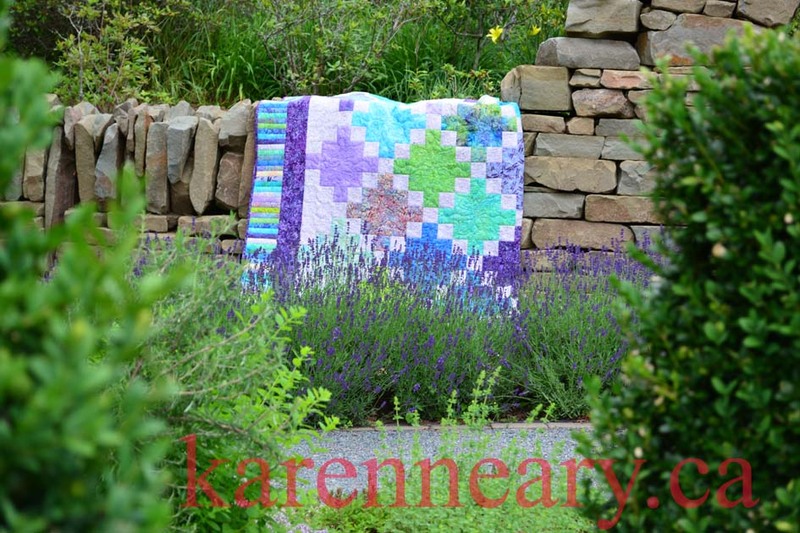 This planting of lavender in front of a stone wall was the perfect shade of purple. When we returned from there, we headed to the Purdy Crawford Centre for the Arts at Mount Allison University (my alma mater) to get a front-on shot. 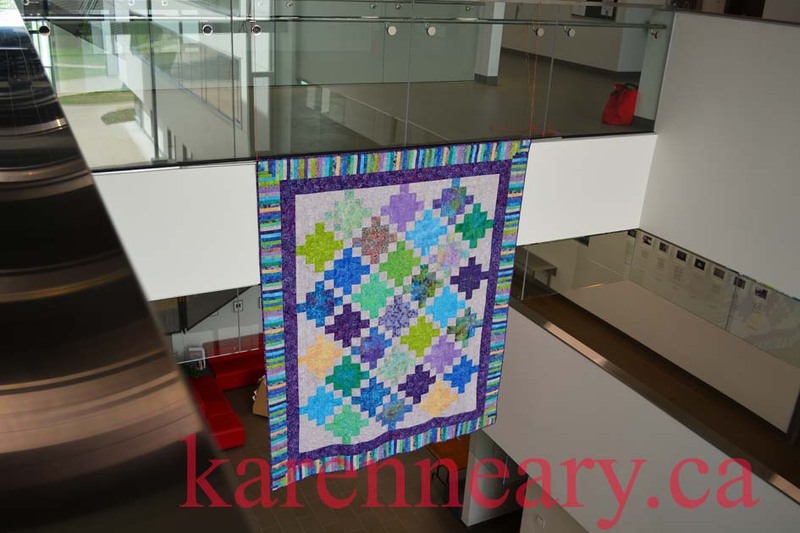 The quilt is a good size, 92" x 110". 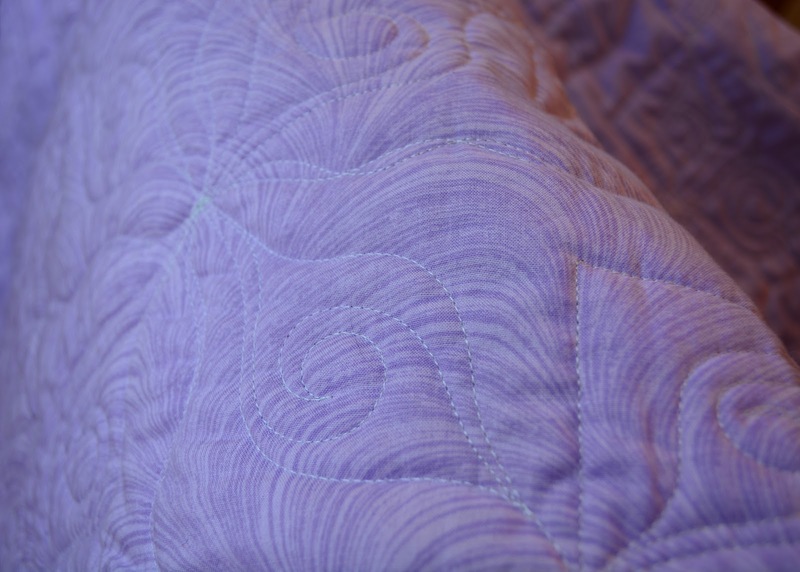 Thank you to Island Batik, Aurifil, and Hobbs for supplying the product used in this quilt. 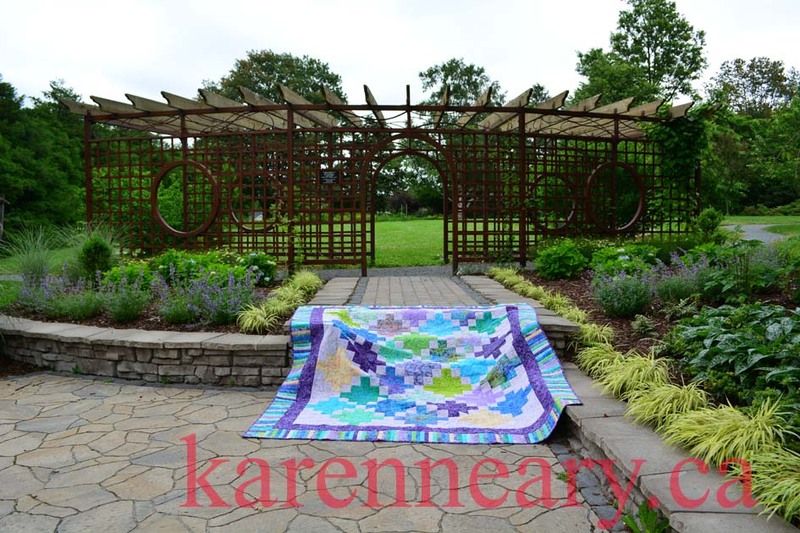 Ambassador Jessica at Dessert Bloom Quilting is also working with "Eclectic Garden", so please visit to see what she has made with this collection. I have a small giveaway of 3 patterns designed using Island Batik fabrics: Sun Salutation, Sunset, and Interlocking Herringbone. 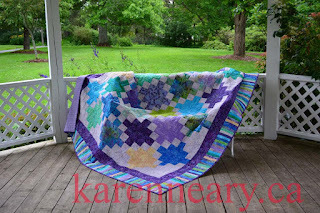 To enter, please leave a comment on this blog (and make sure I have an email address to contact you if you win!) 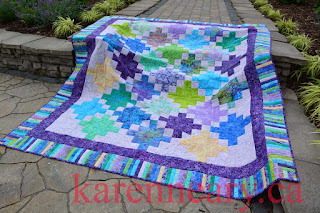 The draw will be made September 5, 2018, at the end of the blog hop. Don't forget to also visit Island Batik to enter to win one of 3 great prizes. 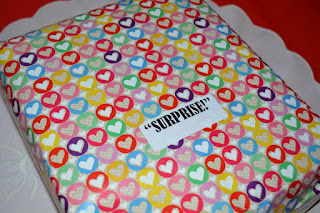 Good luck, and thanks for visiting! This month, I will be participating in a blog hop with the other Island Batik Ambassadors where we show off the quilts made with their new fabric collections. 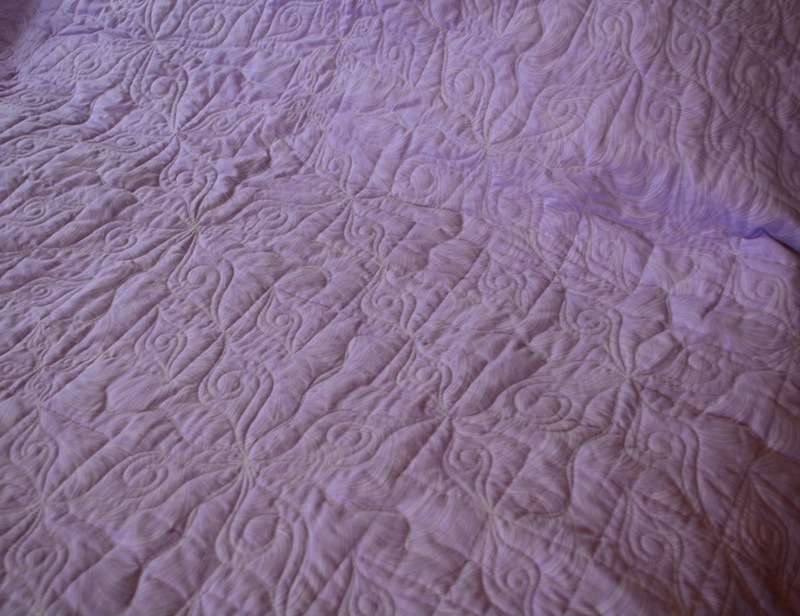 I used up nearly every inch of my collection, and made a rather large quilt. 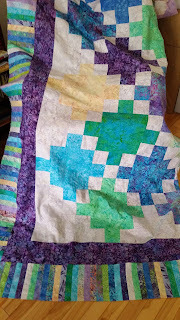 Normally, I quilt all my pieces myself on my domestic Bernina but I couldn't face basting this behemoth in all this heat. Even though it's been a dozen or more years since I have sent a quilt out, I knew I wanted it done by West Branch Quilt Studio. 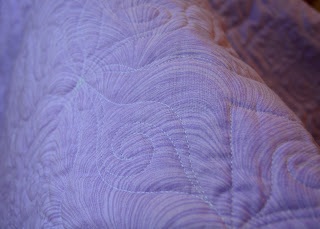 The very talented Denise White does beautiful work - custom, or with one of her 150+ pantographs. 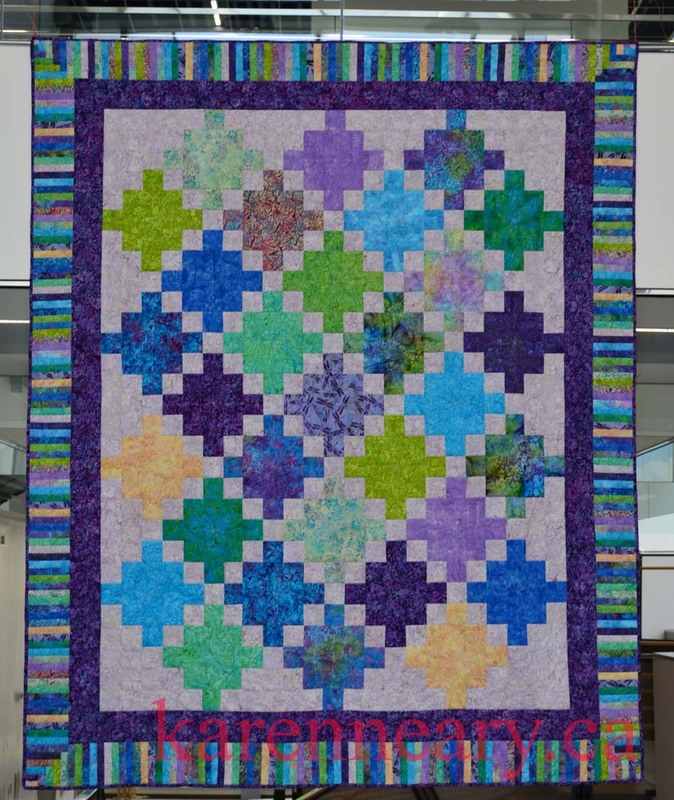 I often admire her work in quilt shows. 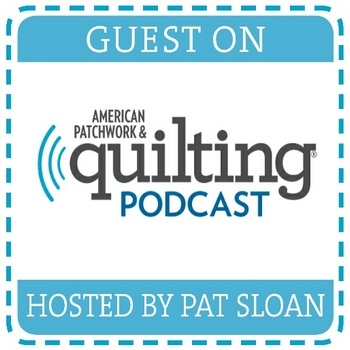 Denise and I chatted over the quilting, and I went with her suggestions for a suitable motif. 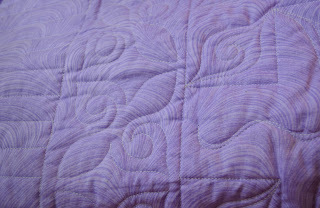 The wide backing came from Mrs Pugsley's Emporium; it's a soft lilac with a grey feathery swirl. 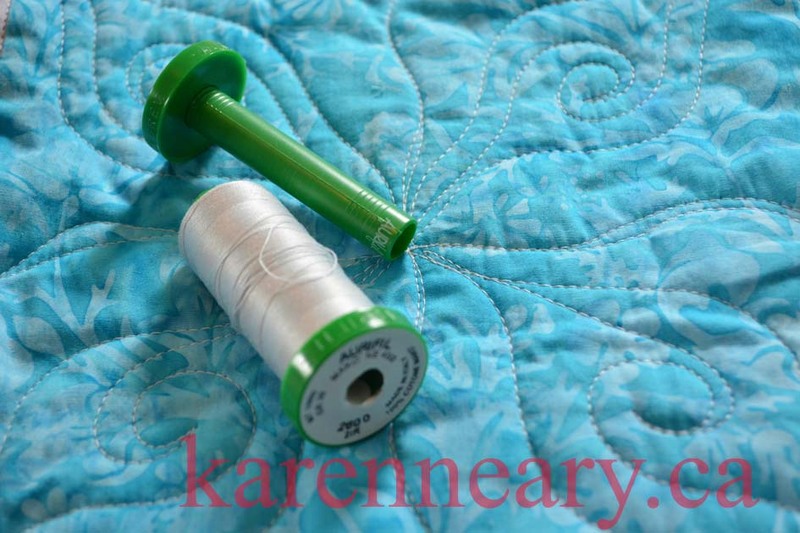 40 weight Aurifil thread in Dove Grey 2600 was a perfect match, and Denise used it top and bottom as it blended well with all the colours. 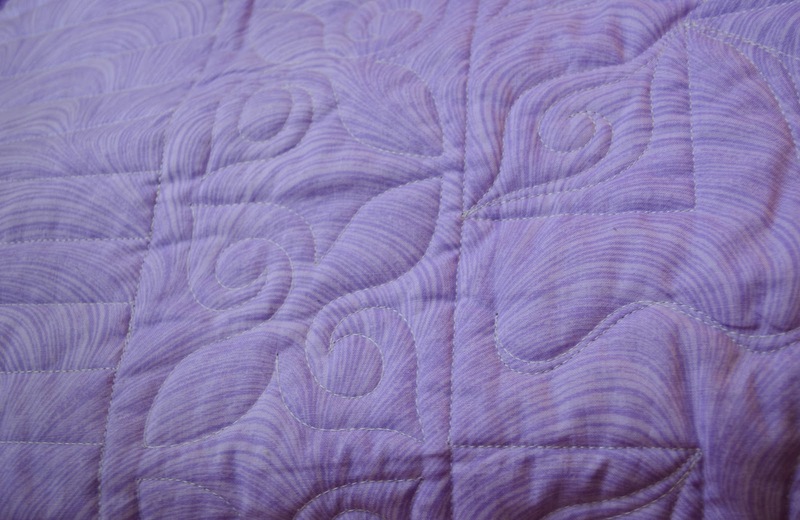 It's always hard to get a good photo of the back, but trust me when I say it's very pretty. 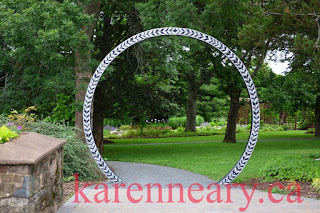 You can email Denise by clicking the link on her name, or find her on Face Book. 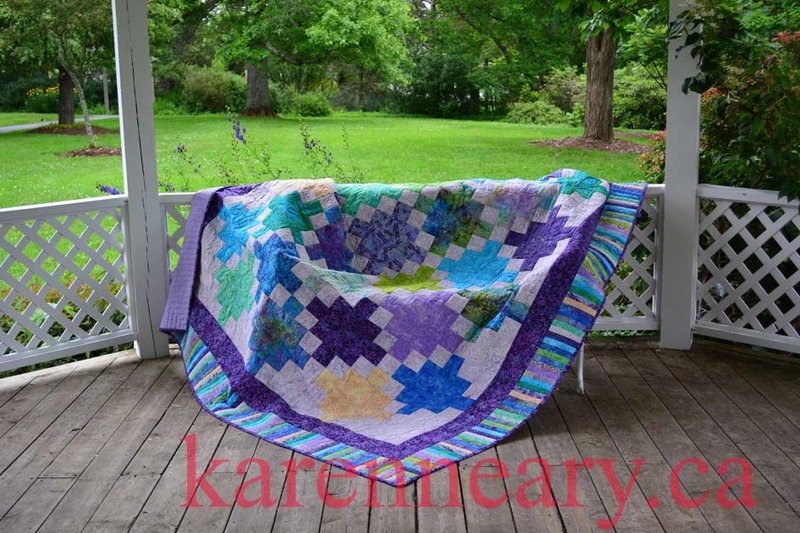 She has a brochure available, and is happy to give a quote for her beautiful work. 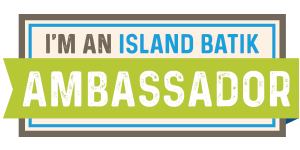 I invite you to check back this week for links to giveaways and posts by all the Island Batik Ambassadors.